Do you want to know how to increase your SAT Math score without learning any more math than you already know? Before I start, I want to be clear that I think if you’re taking the SAT and you don’t already know how to answer all the math questions correctly, you should learn as many SAT math concepts as you can in the time you have to prepare. There’s a limit to how high your score can go if you don’t know the handful of basic math concepts that that SAT is testing for. That’s why when I tutor a student one on one, I always make sure she’s learning the math. If you don’t know how to do a math problem, you can’t get it right. On the other hand, if you do know how to do the problem, you can certainly still get it wrong. The way to improve your SAT Math score without learning any more math is to answer correctly every single question that you know how to do. It’s a simple and obvious answer, but I’ll bet that the overwhelming majority of students who take the SAT are getting several, if not many, questions wrong on the Math section when they know perfectly well how to do the problem. You’d be right, too, for a lot of things. But not for the SAT, not when your chances of admission to the college of your choice are riding on your score. Because the SAT Math section is so steeply curved, when you get a few extra questions wrong, it’s killing your score. If you’re great at math, and you know to do all the questions right, and you do get them all right except for 3 that you just made a little mistake on, your score could drop from an 800 all the way to a 730. If you’re an average math student, 3 extra questions wrong that you really knew how to do could drop your score from a 600 to a 560. The worst thing about it is that I bet a lot of people would be happy if they made only 3 careless errors out of the 54 questions on the Math section. A lot of people make more than that. The first thing is to stop thinking of them as careless mistakes. The issue isn’t carelessness, it’s focus. What’s really went on is that you lost your focus for a moment. That’s good news, because focus is a lot easier to correct than “carelessness”. I’ll tell you how to do it soon. In the meantime, watch my recent student Jeremy talk about how learning to focus helped him dramatically raise his score. I always get 630 on the Math section, because I haven’t learned many of the concepts in school yet. I always try to do my best, but the SAT overwhelms me! The test is really really soon. My dad would prefer that I get a 700. Do you have any suggestions to raise my score? Do you mean that you’re taking the test on 6/4? If so, that’s really soon, and you probably don’t have time to learn anything new. There are several things you can do to get the most out of what you know and try to get those extra 70 points. 1) Practice the 3 step method that I teach in this blog post. If you’re making any “careless” errors, this is the best method I know to eliminate them, or at least cut them way down. 2) Manage your time well. As soon as you recognize that you’re on a problem that you don’t really know how to do, or that will take you longer than most of the others, skip it. Come back to it if you have time left at the end of the section. 3) Review your practice tests to see if there are any type of problems that you often get wrong because you don’t quite understand it or don’t quite have something memorized. If there are, sharpen up your understanding of those one or two things. I applaud you, Jeff, for writing this particular post dealing with careless errors. I am appalled that other online SAT guides either minimize the role of such mistakes or do not mention them at all. I fit the description of the student mentioned above: one who comprehends all of the math questions, as well as discovers and the correct procedure to answer them, and yet who falls victim to three preventable errors. I consistently receive a 710-730 on this section, as I’ve recently begun to underline the key part/term being asked, such as “perimeter,” so that I don’t come up with “area.” This significantly improved my performance. 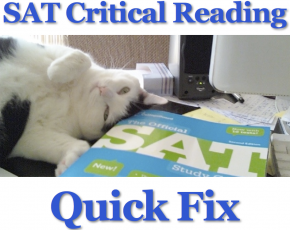 However, do you have any concrete strategies (rather like underlining) for combating other SAT math blips, other than maintaining one’s focus, as mentioned in your next guide? I appreciate your insightful advice in advance. 1) As you pointed out, underlining key terms/parts that they ask you to solve for, such as “perimeter”, helps a lot. So does underlining the variable they want you to solve for. Sometimes they ask you to solve for something like “3w”, or whatever, but we’re naturally inclined to solve for “w”. 2) When a question has a figure, chart, or graph, and the question mentions parts of the figure, make sure that you match up the words in the question with the graph. 3) Also when there’s a figure, etc., write all of the values that you’re given and that you’ve figured out in their proper place in the figure. 4) Write down and label the intermediate steps you take to solve the problem, and the answers you get. 5) Be extra careful whenever there’s a negative number. 6) Before filling in your answer, look at your math and algebra again. That’s the 3rd step in the three step process I mention in the blog post. 7) As you practice, try to pay attention to the kinds of things that trip you up in those couple of errors you tend to get. Are they the same kinds of things? As you learn the patterns, you know what you have to pay closer attention to. 8) If a question is giving you trouble, skip it and come back to it when you’re done with all the others. When we feel like we’ve taken “too long” on a problem, we subconsciously tend to rush the next one, making it more likely that we’ll make a preventable mistake. 9) As you read the question, make sure know what information they’re giving you and what they want you to solve for, before moving on to solving it. That’s the first step in the three step method. 10) Have the patience to practice. This part isn’t the most fun, but you have to practice this to make it work for you. I hope it helps! Let me know how you do when you get your scores back! My score is around 650 but I am an above average math student. I am taking BC Calculus next year and I am killing it in Trig this year. But the thing is I have bad on the spot thinking on geometry and logic problems! You can’t account for them because they are never REALLY the same ! You know? Yes, I do know. Every once in a while I run into a student who is really good in math class in school but doesn’t have the problem solving skills to ace the SAT Math section. Unfortunately, it’s not possible to teach problem solving without seeing you actually work on the math problems. If you’re interested in private, one on one tutoring over skype, let me know. I can definitely help you that way. Where do you live that there are no prep classes? Have you looked for online classes? That can work really well. I don’t offer group classes, only one on one tutoring. It’s expensive, but nothing will help you as much as working directly with me. if you’re interested you should talk to your parents about it and have them contact me here – jeff@satsuccesssecrets.com. No matter what path you choose, there are 3 things you have to improve in order to get the best math score that you can get. 1) Understanding the math concepts tested the exam. For the most part, these are pretty easy. You might need to review some things you learned in previous math classes and / or memorize a few things. However, it’s really important to know that the math itself is actually pretty easy. You can find lots of resources online that teach these concepts, and they also give a pretty good review in the Official SAT Study Guide, which you can get from Amazon. This is actually the harder part of the math section. You have to be able to figure out what the question is asking you to do, and then figure out how to get the answer. It’s almost impossible to get better at this without the help of a class or a tutor, because it’s very hard to figure out for yourself what you need to do to improve. 3) A high level of focus, or attention, so you get every question right that you know how to answer. This is the “don’t make careless mistakes” part. If you’re having trouble here, it can seem very hard to fix. However, this post has the best techniques that I know of to prevent them so that you can get the score you deserve. If you keep reviewing and applying this simple 3 step process it will help you a lot in this area. Practice with official SAT material, as I’ve described in my replies to other comments. When you can’t answer a question, or get it wrong, ask yourself which of the 3 things I listed was the reason you got it wrong or couldn’t answer it. If you don’t understand the math concept, it’s easy to find explanations of math concepts on the internet. The Official SAT Study Guide has a pretty good explanation of all the concepts tested. If you made a “careless” error, keep practicing the steps I mention in this post. It’s the closest thing to a silver bullet that you’ll find, but you do have to practice this method. If it’s not either of these things, then you’re having trouble with problem solving. Unfortunately, it’s really hard for me to help you with that in a blog post or a reply to your comments. You really need a tutor or coach to work with you and see specifically where you’re having trouble. Keep working at it, though! And good luck when you take it again! On my October SAT exam I thought I did amazing on the math section, however when the results came up I realized that I did not do well with a score of 510, although I knew most of the math concepts needed for the exam. After my math report was sent to me I realized that I did not do so bad as I answered 30 questions correct and 11 incorrect from a total of 54. Now I have no idea of how to bring my math score up, do you have any suggestions that can help me in the future? Just to be totally honest for a minute, you can’t get an amazing score if you left 13 questions blank, and answered only 41 out of 54 questions. If you got all 41 of them right, then you’d get about a 650, which is good, but not amazing. There are 3 components to getting the best math score that you can get. 1) Understanding the math concepts needed for the exam. So are you suggesting that I don’t skip a problem ? Since I have limited time, will it affect me if i focus on question for a long time ? That’s not at all what I’m suggesting! You have to skip the questions that are harder for you, and then come back to them if you still have time after you’ve answered the other questions that are easier and quicker for you. You’ll probably find that some of those questions will seem much easier when you come back to them a second time. If you focus on a question for a long time, before you’ve had a chance to answer the others, it will hurt your score in a big way. So whenever I take the SAT for practice my score is always between 600 and 640 and it hasn’t really changed so far. By the way I guess I’m focused on the test all the time and I know the concept. I really don’t know whats wrong.. When you get problems wrong, do you know why? Are they concepts you don’t know? Did you have trouble with the problem solving? Did you fully understand what the question was asking? Did you make any “careless” errors? Of course, you know from this post that I don’t think you can correct “careless” errors by thinking of them that way, you have to look at it as a matter of focus. However, I don’t mean focusing on the SAT all the time (although that’s not bad), I mean when you’re doing a math section, focusing on each part of the problem when you’re doing that part, and not rushing to the next step or the next problem. That being said, focusing the way I mention in this post only lets you score at the top of your current ability. So you also have to look at concepts and problem solving. Feel free to let me know of any specific problems you had trouble with.